Kernels and Excessive Functions. Kernels. Excessive Functions with Respect to a Kernel. Excessive Measures and Sweeping. Complementary Results. Theory of Reductions and Sweeping. Gambling Houses, Reductions. Sweeping Defined by a Convex Cone of Continuous Functions. Convex Compact Sets. New Methods in Capacity Theory: Applications to Gambling Houses (Appendix). Multicapacities. Capacitary and Analytic Operators. Application to Gambling Houses. Various Applications and Complements. Semigroups and Resolvents. The Fundamental Definitions. Elements of Potential Theory. Ergodic Theory for a Resolvent. Resolvents in Duality. Compactification Methods. Construction of Resolvents and Semigroups. The Hille-Yosida Theory. Applications to Hunt's Theorem. Some Examples. Some Remarks on Energy. Commentaries and Historical Notes. Bibliography. Index. 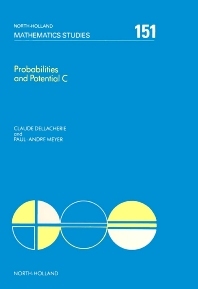 This third volume of the monograph examines potential theory. The first chapter develops potential theory with respect to a single kernel (or discrete time semigroup). All the essential ideas of the theory are presented: excessive functions, reductions, sweeping, maximum principle. The second chapter begins with a study of the notion of reduction in the most general situation possible - the gambling house'' of Dubins and Savage. The beautiful results presented have never been made accessible to a wide public. These are then connected with the theory of sweeping with respect to a cone of continuous functions, and the integral representation in compact convex sets. The third chapter presents new or little-known results, with the aim of illustrating the effectiveness of capacitary methods in the most varied fields. The last two chapters are concerned with the theory of resolvents. The fourth and last part of the English edition will be devoted to the theory of Markov processes.